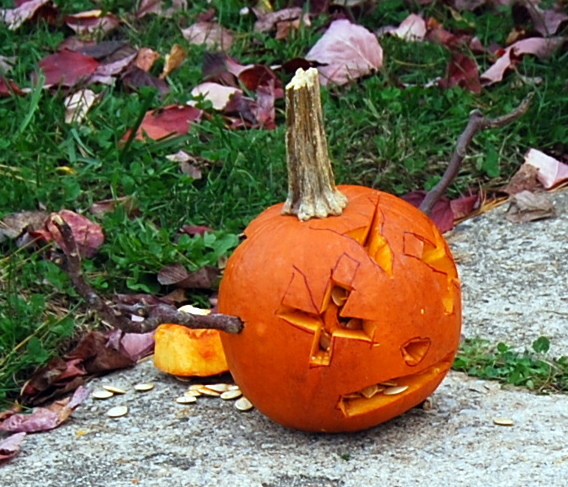 Halloween safety is a concern for every parent this time of year. 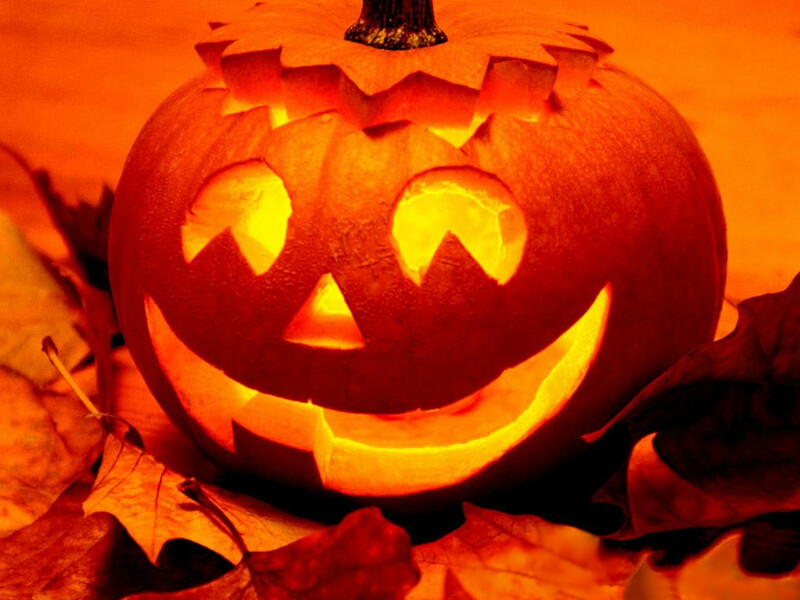 Here are some helpful tips and also some myths discussed to make your Halloween Safety effective and still keep the fun in the holiday. Halloween Candy Myths – Did you know there has never been a documented case of stranger product tampering involving Halloween candy? I did not. Yet Denver police are coming out “guns blazing”, warning parents about potential hazards due to the legalization of marijuana. Jim from Left Wing Libertarian disputes the validity of those concerns. 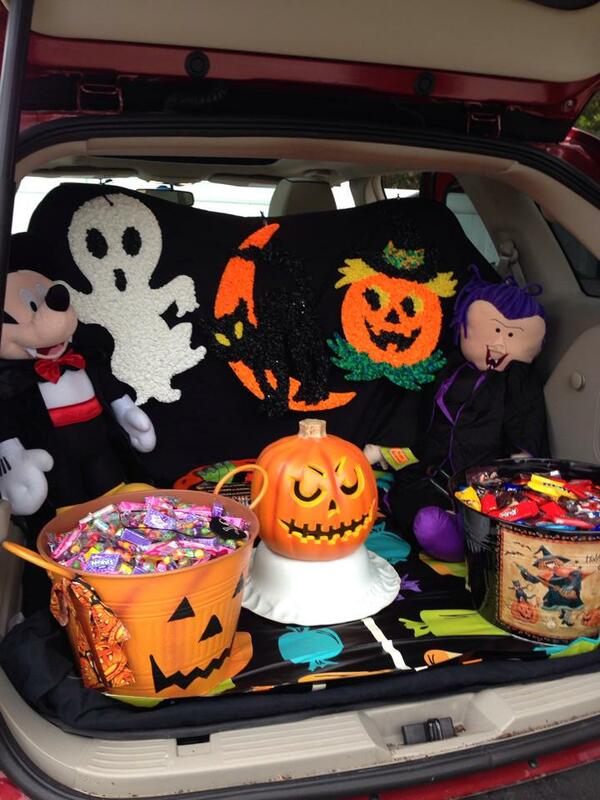 Trunk or Treat, the safer community friendly alternative to door to door Trick or Treat – but be prepared to up your Trick or Treat treat budget. We easily gave out almost 1000 pieces of candy last year! Common Sense Halloween Safety – Some things, you just know are the wrong thing to do, especially with regard to costumes (no full face masks on little ones! ), when to call it a day and turn your porch lights off, and which houses to avoid while trick or treating. 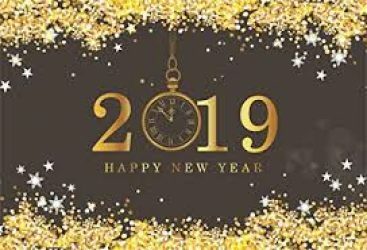 Be safe, have fun, and don’t forget to send all of your Clark bars and Butterfingers to me! There will be way more treats than tricks this Halloween! The Kimmel Center Academy of Music will be featuring an extra-special KIDS NIGHT, next Friday night, Halloween. Hosted by BEN-FM’s Marilyn Russell, the steps of the Academy will be filled with Halloween fun! You’ll find a photo booth, Halloween goodies, and a performance by dancers from the Philadelphia High School for Creative and Peforming Arts. But the fun doesn’t have to end on the steps of the Academy! Select seats are being offered at 50% off! Disney’s Newsies is a great way to introduce your kids to the theater – and a phenomenal way to cap off your Halloween night. They delivered the papers, until they made the headlines… Direct from Broadway comes Newsies, the smash-hit, crowd-pleasing new musical from Disney. Winner of the 2012 Tony Awards® for Best Score and Best Choreography, Newsies, has audiences and critics alike calling it “a musical worth singing about!” (The New York Times) Filled with one heart-pounding number after another, it’s a high-energy explosion of song and dance you just don’t want to miss. 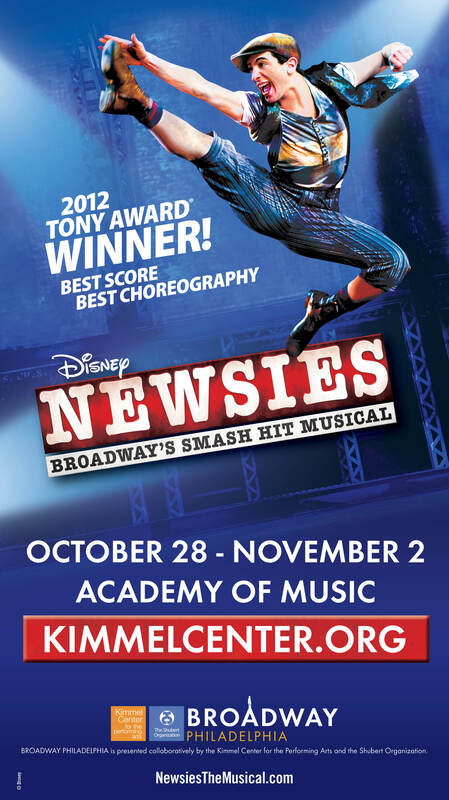 For tickets to Newsies – and other Broadway-Philadelphia shows at the Kimmel Center – visit www.kimmelcenter.org/broadway. Halloween Horror Nights or Mickey’s Not So Scary Halloween Party? When the leaves begin to change and the air has a bit of a chill, I know it’s time to start thinking about heading to Orlando to celebrate Halloween. For our family, it’s almost always been Mickey’s Not So Scary Halloween Party at the Magic Kingdom at Walt Disney World. I love the family friendly entertainment, and I hate being scared – and not just because I have bladder issues. Great for all ages: Disney does “not so scary” better than anyone. The decorations are happy and fall-ish, and the shows, parades, and characters all echo the not so scary theme. You’ll find all of your favorite attractions open, and the added bonus of trick or treat stations – candy for everyone! Everyone can wear a costume – just be aware that the costumes can’t be offensive, violent, or obstructive. Keep the full face masks at home, too. Trick or Treating is welcome and Mickey’s Not So Scary Halloween Party even provides bags for the kids and the adults. Cost for adults is $67 – $71, depending on the date you choose. The price is for the party only – and you will need a separate ticket if you are going to spend the day at the Magic Kingdom. The Mickey’s Not So Scary Halloween Party begins at 7 and goes until midnight, however, you can enter the Magic Kingdom beginning around 4 PM with your party ticket. Definitely not recommended for young guests. This is a pretty intense experience, with interactive components designed to make you pee your pants. They call it Halloween Horror Nights for good reasons. Guest absolutely cannot wear costumes. I think they take great pleasure in knowing they’ve caused you to pee your pants, and they don’t want you to hide that behind a costume. Or it’s for everyone’s safety. Or something. No trick or treating. Boo. Cost – well, here’s where it gets complicated. Halloween Horror Nights has a variety of ticket options. The cheapest, which will set you back about $42, is an add on ticket. You pay for a day at Universal Studios, and you can add the evening at Halloween Horror Nights on for $42 more. If you have a condition that causes you to spend your day sleeping in a coffin, coming out only after sunset, the ticket for the party by itself is $96. Then there are multi-day options available that can include as many as 22 nights at the party, PLUS an Express Pass. That last option is in the $250 ballpark. The party begins at 6:30, and the ending time depends on the night you go – either midnight, 1 AM or 2 AM. You’ll find the longer parties closer to Halloween. The choice is yours – cute characters (Mickey’s Not So Scary Halloween Party) or creepy creatures – *Halloween Horror Nights). Candy or killing (not the real kind). 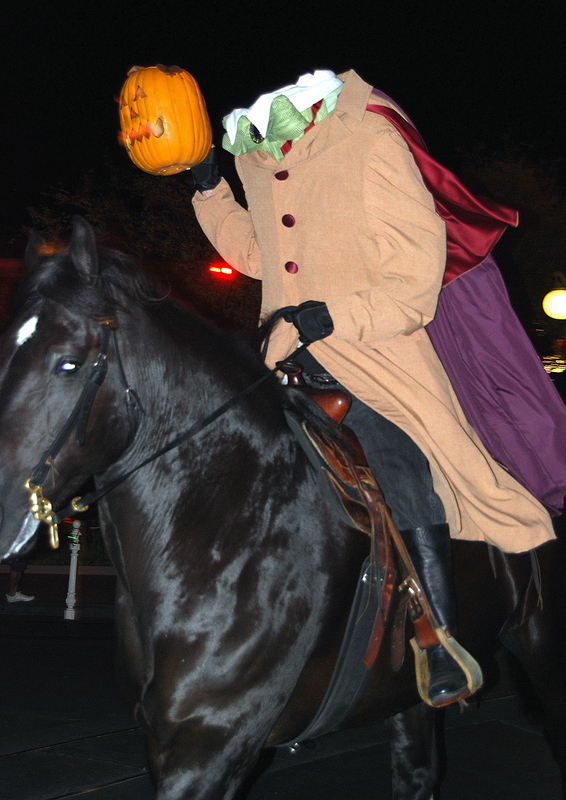 Either way, these are two great Halloween options in Orlando. A favorite from my personal Mickey’s Not So Scary Halloween photo collection! Trick or Treat…or Something Else Entirely? 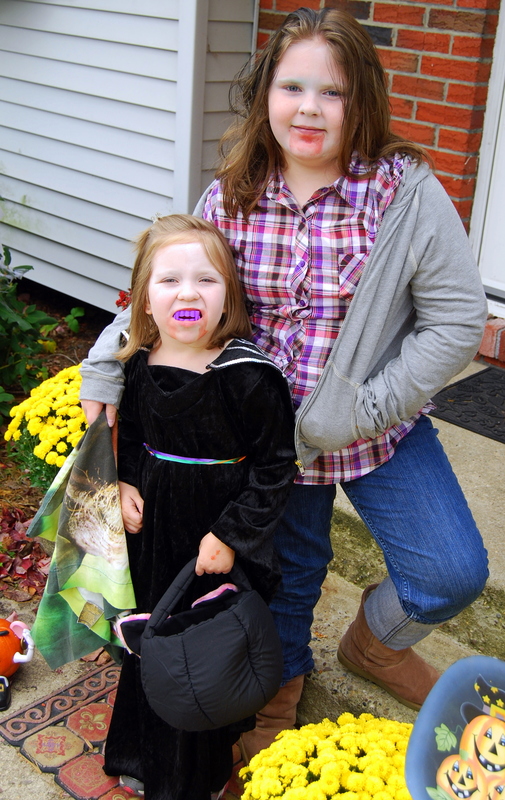 I don’t think Halloween is any scarier than when I was a kid, but I know I certainly stress more now that I’m a mom! But now, moreso than when I grew up, there are community alternatives to traditional trick or treat. And even if your neighborhood doesn’t participate in one of the cool alternatives, borrow one of these and make it your own! These are popping up all over the place in this area! 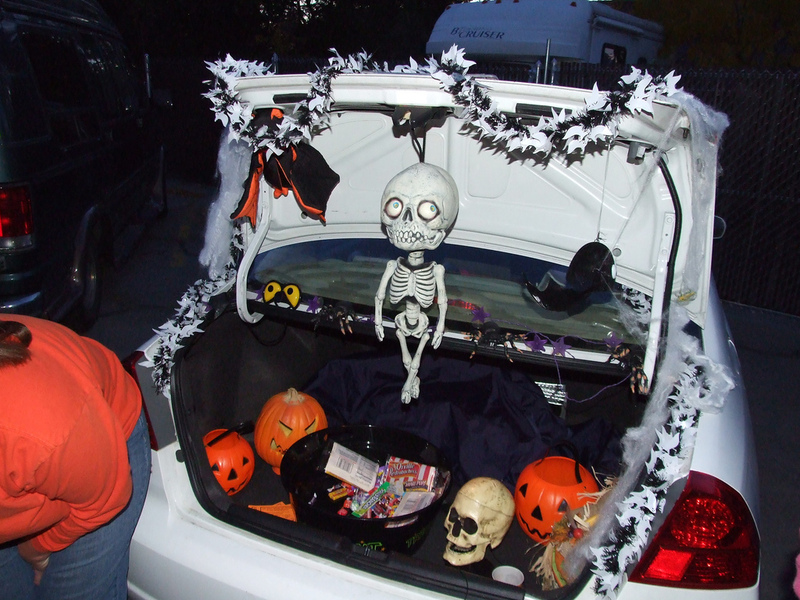 I see quite a few Church groups and community organizations opening up their parking lots to parishioners to come and hand out trick or treats from the trunks of their cars! The theory here is that you are usually with people you know from your church or neighborhood community group, so you know who your kids get candy from. 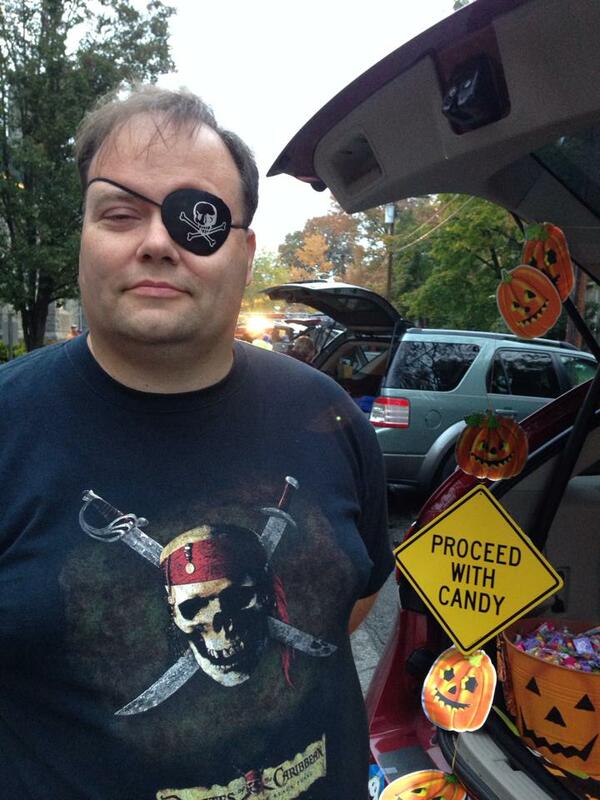 Some folks go all out with car decorations, but others just stand there with a bucket of candy to hand out. It’s great fun – and especially for little ones, who don’t want to walk up and down steps, it’s an easier method of trick or treating. ry convincing kids who have visions of sacks full of Hershey bars and Skittles that they should stay inside for Halloween. 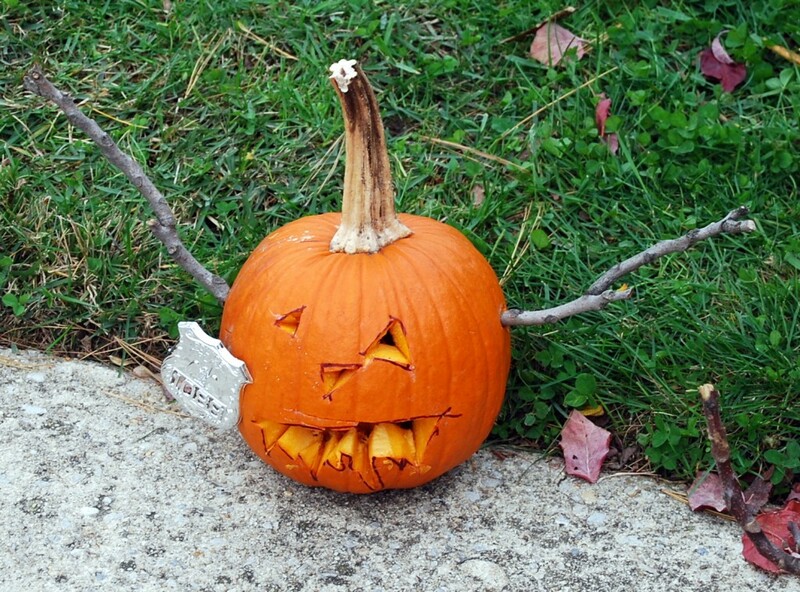 The best way to do this is to ask each family that brings a kid to bring a bag of candy. 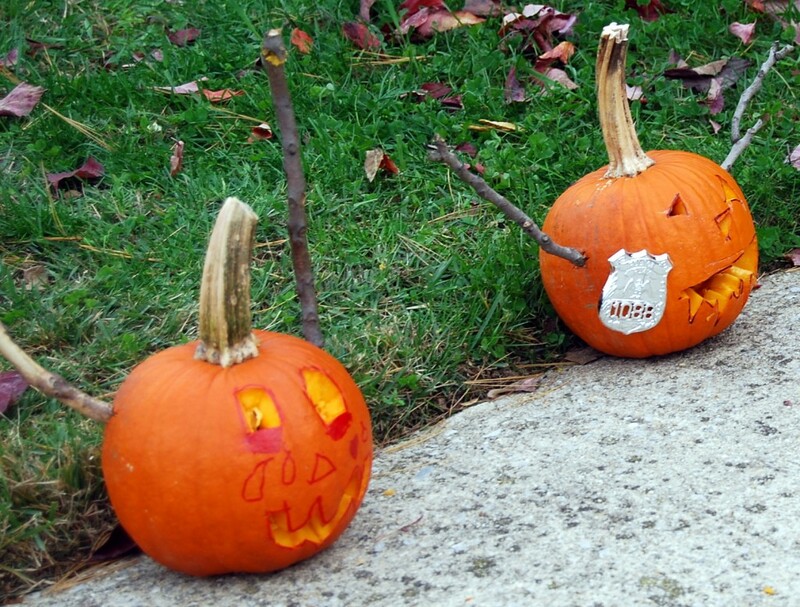 You can set up trick or treat stations around your house and in your yard with a game of some kind at each station. For each game completed, the kids get a piece of candy. Alternatively, set up a night of watching scary movies and games, and while the kids are watching movies, make up treat bags to hand out as they leave using the candy the everyone brought! Check nursing homes or assisted living facilities in your area – or even senior citizen apartment complexes. 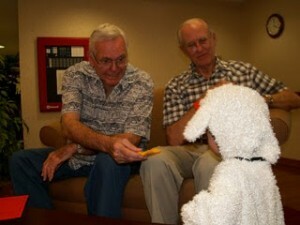 For many of these grandmas and grandpas, it’s a huge treat to see the little ones dressed in costumes! Many nursing homes permit trick or treating in common areas, and the residents are happy to hand out candy and comment on how cute the kids are! You don’t have to live in Orlando or be traveling to Walt Disney World for Mickey’s Not So Scary Halloween Party to check out theme park Halloween festivities. 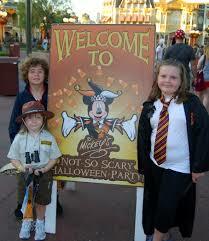 Many theme parks – even those that close when the weather gets cold – have some Halloween festivities. Many have trick or treat stations set up for the kids to gather goodies, plus you may find Halloween themed shows or characters. In my area, there are Halloween events at Six Flags Great Adventure; Hershey Park; Dorney Park; and even down the shore! You could even organize a street fair for your neighborhood; a party at your kids’ school (complete with Halloween parade); or pitch in with a bunch of family and rent out a community center for a big family Halloween bash. Just remember to have lots of treats, lots of games, and lots of fun! It’s an excuse for our children to eat all the stuff we warn them not to eat 11 months out of the year. In my house, I’m usually tossing out the Halloween loot at Christmas, when all the Christmas loot comes into the house. 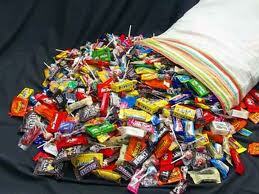 No one needs this much candy! When I was a kid, we had a couple of houses that used to toss pennies in our trick or treat bags. We hated those houses. 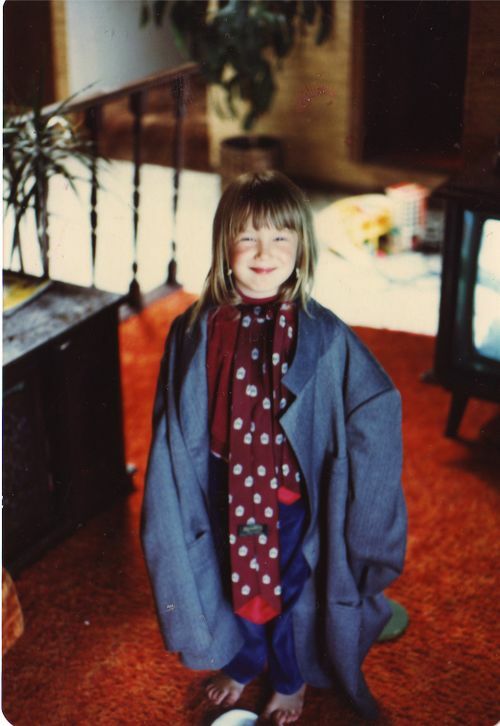 I mean, as kids, you don’t realize that if every house you went to tossed a few pennies in your bag, you could buy yourself a record (round, black vinyl, made musical sounds, predated CDs and MP3s) or a pair of sneakers (without a basketball player’s name etched into them). We just knew that it wasn’t candy, and because it was usually only a couple of house that threw us the change, we couldn’t even get a decent comic book. 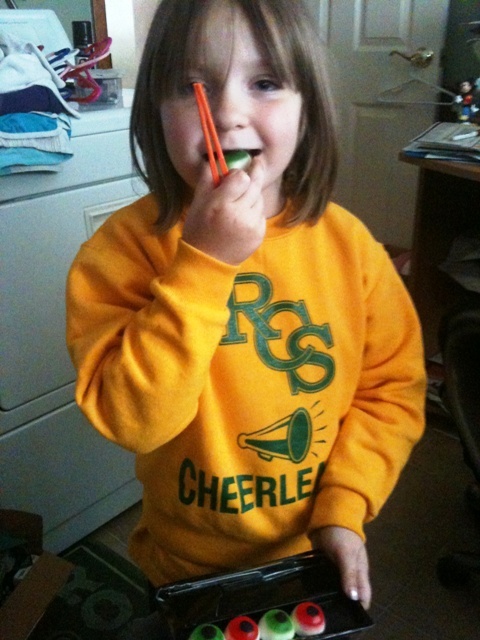 But now, the options are virtually endless if you want to give kids something a little less cavity inducing. And the things you’ll find won’t break the bank – even if you are the most popular house on the block! 1 – Fast Food gift certificates – I hear you already – a groan just went up, and half of you said something nasty about me under your breath. Is she crazy? 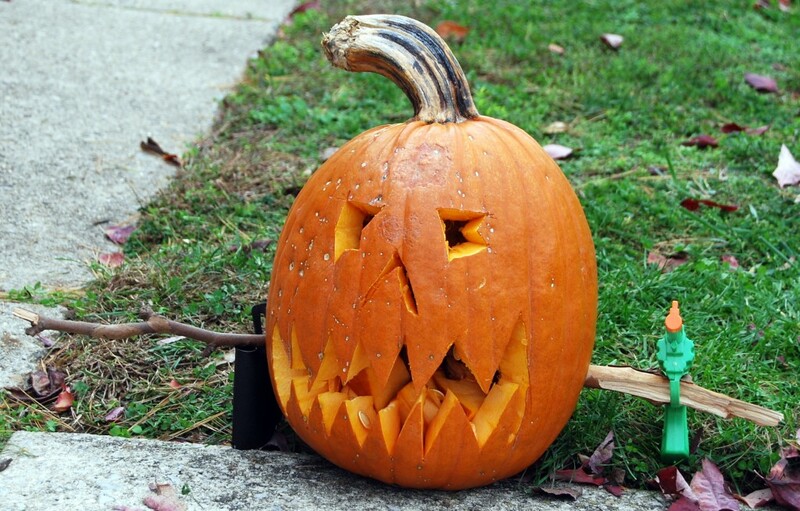 Let’s worry about our kids’ weight and teeth and not give them candy. Let’s give them fat and calories instead! I’m not crazy. Alright, I am crazy, but hear me out on this one. The gift certificates (which you can get 10 for $1 from places like Wendy’s) are good for a kid sized Frosty or a small pack of french fries, depending where you go. There’s nothing wrong with a small treat now and again, and the fact that your kids will have their own “money” to pay for it with their gift certificates will make them feel important. It’s much better to splurge on a small bag of fries as an afternoon snack than to gorge on choclates and sugar for a month after Halloween. 2 – Mini PlayDoh – My kids love PlayDoh, and the youngest at age 6 can easily get an hour out of a single color in one sitting. 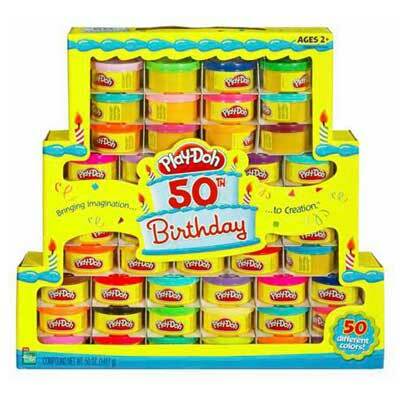 You’ll find mini PlayDoh packs at party stores, warehouse club stores, and even at places like Target. No fat, no calories, tons of fun. 3 – Snack size bags of, well, Snacks – Practically every store you go into that has a Halloween display will have some sort of non-candy snack alternative. You’ll find small packages of gold fish crackers, pretzels, fruit rolls, popcorn, and granola bars. I love to get these treats as much as the kids do, because I throw them into lunch boxes in the days after Halloween – like an extension of the day itself! 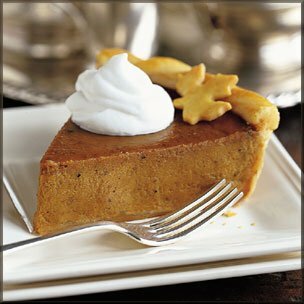 I also don’t mind having this kind of treat left over at the end of Halloween night. These are healthier options that kids love and eat every day anyway – just in fun shapes or cool Halloween packages! 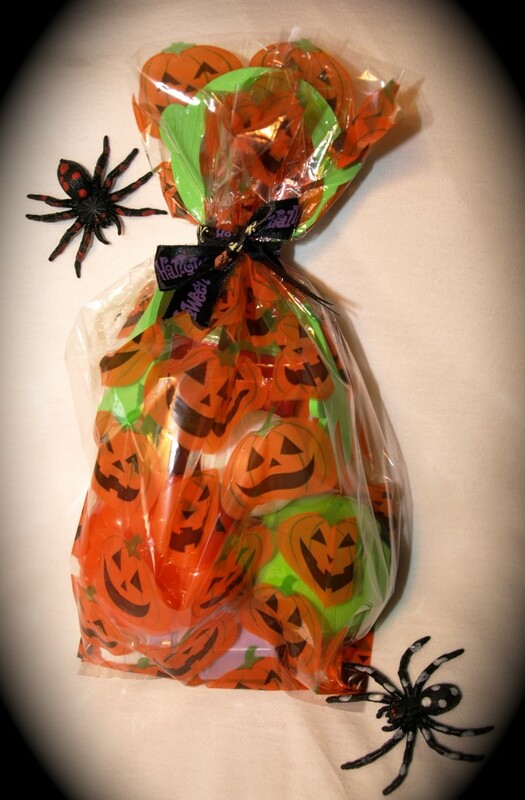 4 – Halloween goodie bags – Who doesn’t love a goodie bag? Yeah, I know, the moms who have to clean up the little toys and wrappers from the goodie bag – but we’re talking kids here! You’ll find loads of tiny treats at the dollar stores or at Target that you can put into a treat bag for just a few cents. There are pencils, Halloween shaped erasers, spider rings, temporary tattoos, stickers, vampire teeth and eye ball super balls. You might even find small Halloween themed note pads, post-its, and the popular vampire teeth. Toss them all into cellophane bags, and you’ll have an awesome treat! 5 – Bubbles! Gotta love bubbles. Have you been to weddings, where in an effort to save the planet the bride and groom give little bottles of bubbles to blow instead of throwing rice? Well, you can find those little bottles of bubbles in Halloween colors! Sure to be the hit of the treat bag, these are usually sold in cartons of about 24 pieces. 6 – Sugar Free Gum – This is about as close to actual candy as you can get without treating with actual candy. There are plenty of options for sugar free bubble gum, which is a sweet treat without the sugar and calories. 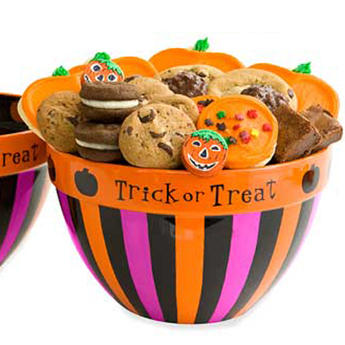 Think twice before you give treats that might cause allergies – like those with peanuts in them; and if you are going to do the tiny treats, have something on hand that you can give to your younger trick or treaters. Some of the small things can be a choking hazard. All of this is stuff that your own kids will use if you have left overs, and you won’t really mind if they do. I’m confident that if your kids bring home a bag of this kind of Halloween treat, you won’t have anything left to throw away at Christmas! 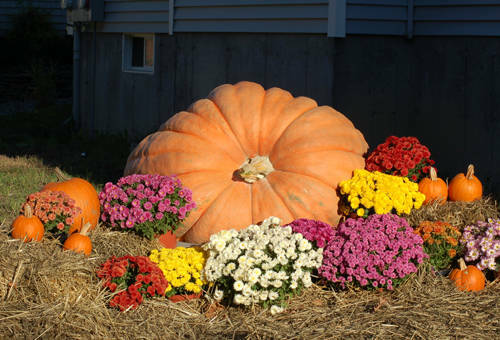 Yep, he managed to get me to drive him to the garden center and pick up a few last minute pumpkins. And it turned into a shoot out at a bank. He wanted to find little white satchet bags and write giant black $$’s on them, but didn’t find them. And luckily for me, he didn’t find a bolt of white canvas either. The comments from our trick or treaters? Awesome. They loved them all. This is our gangster pumpkin. You can tell by the bad skin and bad teeth. Oh, and the weapon might be a clue as well. This was the poor old sod who was the first to meet the bank robber. It didn’t end well for him. This would be the bank security guard. Perhaps had they armed him instead of the bank robber, the whole massacre could have been avoided. While this other poor victim fared way better than the first, she did so through the pool of tears that formed as the water works streamed down her face. Oh what it did to her makeup! Next year, I am either not giving him any pumpkins, or I am spending the months of September and October reading him fairy tales. Maybe next year instead of a massacre, we’ll have a happier, more Disney-fied theme on our front walk. Yep, eyeball sushi. The traditional Halloween treat from Japan. Could this stuff get any nastier? 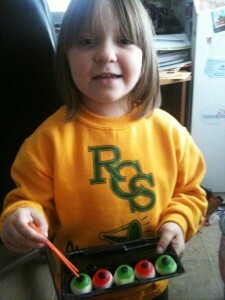 She is having a hard time picking up the squishy gooey eyeballs with the chopsticks. I suggested she use her hands. 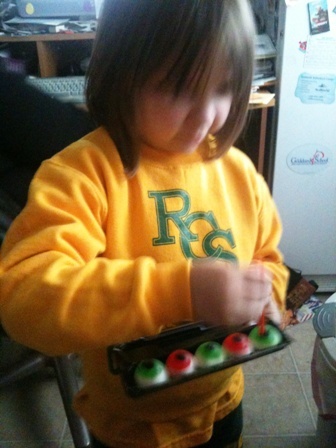 Granuaile says “I’ll just stick the chopsticks inside the eyeballs to eat them. Gross. Yes, they are as nasty and disgusting as they appear – they were tossed into the trash after this initial taste! Along with the brain and eyeball “lo mein” noodles Eilis had. So much for scaring my kids with Halloween treats – apparently, they are more scared of high fructose corn syrup, and refused to eat them!